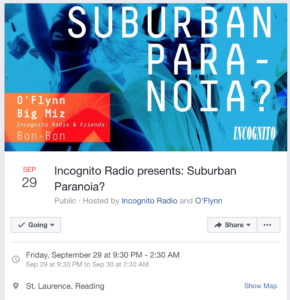 Incognito has cultivated a revolution in Reading’s quiet underground music scene. 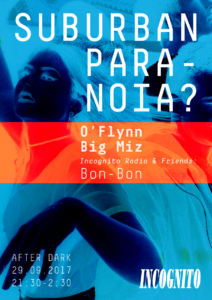 Springing up from a radio studio, Incognito Radio is the central hub for artists and music lovers to come together through the club events and radio podcasts they provide. 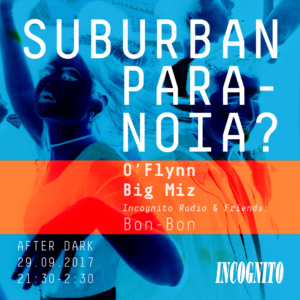 Incognito Radio were looking to strengthen their professional image and branding to help tie together all of their social media and event campaigns under a more coherent image and website. 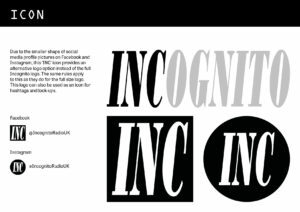 Being an urban, electronic music brand, Incognito already had a substantial vision and image that they had developed for themselves and it was our job to strengthen and develop this to help them grow in the future whilst still keeping an essence of authenticity. Our design team consisted of Hector Penrose, Callum Bendelow and Jordan-River Low. We all provided different skills and areas of expertise throughout the project. 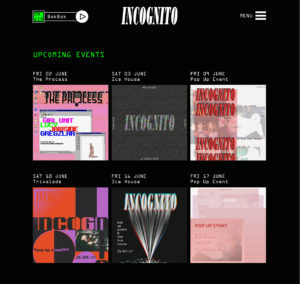 As a group, all 3 of us were familiar with Incognito’s events and music scene before accepting the real job and we had organised the project ourselves. We were also familiar with the co-founders of Incognito before the project so this instantly put us in a more casual situation which we will discuss in more detail later. Early on in the project though we came across some difficulties regarding a cancellation of an event which we were designing a poster for as this interfered with our schedule. The clients then requested that we design a different poster and logo for something else that wasn’t initially agreed on and it didn’t adhere to the brand guidelines. This problem arose because of the casual relationship we initially had with our clients. We sorted this out by referring back to the brief, explaining that it wasn’t in the contract. This showed the importance of the restated brief and we also realised the necessity of maintaining a professional client relationship throughout the duration of the project in order for tasks to get completed to the highest of standards. Throughout the project, our main way of communicating between team members and with our clients was through Facebook instant messaging group chats and a private Facebook page where we would arrange meetings to discuss progression and show our work for feedback in a more informal way. However for final submissions we used email to contact our clients in a more formal manner. This also meant that each person had a backed up copy of the work. We also set up a Creative Cloud file that all 3 of us were all connected to where we could post updated work. This enabled each team member to edit the final documents and show design ideas during the making process. It also meant that we were all working on the same final file so each of us had identical copies of all of the work in one accessible place when working from home. This online basis for exchanging ideas between each other was essential as the website side of the project ended up going over schedule and into the summer holidays. However, through the use of our Facebook group page, email and Creative Cloud files we were able to to stay in regular contact with each other to ensure we were all connected on every stage of the design process. We started the design process by deciding on the brand guidelines which would then govern the rest of the visual design of the other deliverables such as the website and poster templates. The guidelines cover everything from brand identity to logo usage and colour schemes. 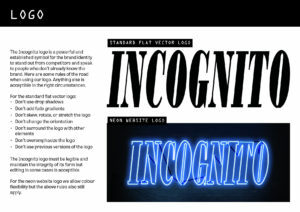 By starting the project with designing the brand guidelines, they acted as the foundation for the other deliverables and the future image of Incognito. After confirming the overall visual identity we moved on to develop the Instagram and Facebook icons. To do this we simply took the ‘INC’ from the existing INCOGNITO logo in order to stick with the existing logo they had already developed. The ‘INC’ formed a compact square or circle shape to then be used as the profile picture for social media accounts such as Facebook and Instagram. After confirming with our clients that they were happy with the brand guidelines and image we had developed, we applied the visual principles to 3 event poster templates: Facebook, Instagram and print. This was to provide guidance for the content, format and style of future promotional material to keep consistency in their image and identity across all mediums. 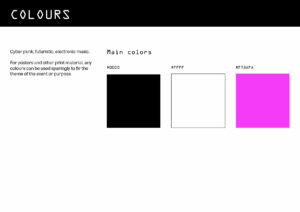 These templates are also featured in the brand guidelines. 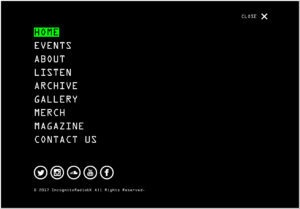 Once all other deliverables were finalised we started planning and designing the website. 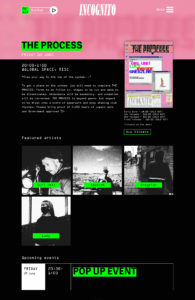 We began by going straight into Photoshop to quickly mock up templates and work out the navigation and user journeys. 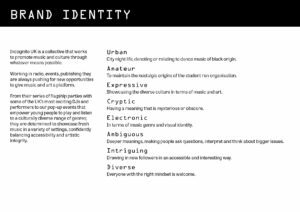 We then moved onto high fidelity mock-ups and here we were able to apply the visual identity from the brand guidelines. The content and specification for the website was provided early on by our clients which massively sped up the whole process. After meeting as a group on a regular basis and constantly keeping in contact with updates on the Facebook chat we finalised our wireframe design with our clients in person and then moved on to coding. Due to the nature of the coding, Callum was mostly responsible for this process due to his experience. Hector and Jordan were in charge of visual design and helped with coding where possible. Here we learnt how to use our strengths and weaknesses to maximise efficiency within the group. Overall the project ran smoothly but the problem with using Facebook messenger is that often you could return to your laptop with 100 unread messages between 2 of the group members and then have to read through all of them. For finished work and more official correspondences we always used email to stop this from happening. Facebook was later used for quicker feedback on screenshots of unfinished work and for the purpose it served us well. However in the future we wouldn’t use it as a mode of contact between clients as it reduces formality and structure to the communication. It possibly worked well for this project as we were already familiar with our clients. After handing over the final deliverables to my client we received an email of thanks. It was satisfying to know that the final outcome was well received and even more so to see the deliverables put to use throughout their social media platforms and on the newly launched website. After we finished the project, all 3 of us had already made plans to stay in contact with Incognito for future design jobs and the website would need future maintenance and editing to keep it up to date. This shows the overall success in our relationship with the clients. On the whole our project was successful, it made us realise the importance of working on a project which we were passionate about and with team members we got on well with as this meant that we could produce work to the highest of standards. Despite not meeting our original deadline of finishing everything by the end of the 2017 summer term, we instead learnt how to re-negotiated the deadline with the clients to have everything done for the beginning of the 2017 Autumn term and this enabled us to produce work to a much higher standard. It was also very rewarding knowing that we were also helping out a student run business and for a cause we are all part of and passionate about. As well as learning technical skills such as wire framing, writing brand guidelines and the process of coding a website from scratch and getting it online, overall the real job project taught us the importance of being mediators and negotiating design differences with team members to meet in the middle and combine ideas. It also taught us the importance of meticulous planning before approaching a design project with a client, however when difficulties did occur we learnt how to negotiate timeframes so everyone involved was satisfied. Finally we learnt the importance of having a healthy relationship with our clients that balances a professional and open correspondence. The main thing we learnt from this project is that even when working for friends and family it is important to maintain a professional relationship in order to keep the structure and standards of the project high. The success of the project and our relationship with the clients is emphasised through the fact that they have asked all 3 of us to become the design team for Incognito Radio as a part time job next academic year. This is very exciting as we will be able to improve on the branding that we have begun to develop for them throughout this real job and see Incognito Radio grow with our input.